The story as best we can understand it is largely speculative. It is based on recollections passed through generations as family and other informal history, tied into a few documented events and dates. The colonial gentry sometimes kept journals and preserved letters and other documents for posterity; the Halls weren’t and didn’t. Some Hall papers are held by the Mitchell Library in Sydney. A few documents are treasured by Hall descendants. Some material is understood to have been purposely destroyed, to hide it from prying eyes. At all times, keep in mind that the Halls Heeler is ancestor both to the Australian Cattle Dog and to the Australian Stumpy Tail Cattle Dog. George Hall (1764–1840): the beginning of an empire. The Halls Heeler story begins, not with Thomas Hall on Dartbrook but with his father, George Hall, at Percy Place. From Percy Place, his home in Pitt Town in the Hawkesbury Valley, George was the mastermind and founder of an empire that lasted for thirty years after his death in 1840. George’s forebears owned farming estates, largely accumulated by his grandfather but, by the time George was born in 1764 the legal process of Enclosure had long been in place. Small land holdings and common lands were consolidated into larger farms under single ownership — in the interests of agricultural efficience but to the benefit of the wealthy and with complete disregard for those dispossessed. George’s father is thought to have been a tenant farmer on one of the larger estates in the Lorbottle area of Northumberland and may have held a position of trust or privilege on the Earls of Percy estates. George, himself, would later name his home in Pitt Town “Percy Place” after one of the Earl’s residences; perhaps as a mark of respect. Hannah, George’s mother, also came from a north of England farming family, the Stirlings. The Halls and the Stirlings were staunch Presbyterians at a time when religious dissent was often a disadvantage, though apparently not for young George Hall. He benefitted from the strong Presbyterian tradition of education while he was a boy and, later, from the mutual support within Presbyterian congregations. George attended the Branton Presbyterian Church School in Northumberland. It was usual, at that time, for most children in England to leave school at the age of twelve but George’s exceptional ability was evident to his teacher and he was encouraged to attend night school for another two years. His school days were over when he was fourteen and he was apprenticed as a carpenter and joiner. Later he completed another apprenticeship, in agricultural machinery, complementing his boyhood familiarity with agricultural practices. Despite his having grown up on a farm, it was evident that there was no farming future for George in Northumberland. Around 1788, the year in which the First Fleet planted the Union Jack in Port Jackson and declared New South Wales to be a British colony, George sought career advancement and moved to London, carrying with him a letter of introduction to Presbyterian congregations there. George prospered. A housing shortage in London was to his advantage — he was a qualified builder — and he was able to build under lease agreements, making him landlord as well as builder. By 1791 his finances were sufficient to support a wife. He made a hurried trip home to marry Mary Smith, finalising a long understanding between himself and Mary. Like George, Mary came from a farming background. In London, George and Mary built close friendships within the congregation of the Wells Street Presbyterian Church, including members of the group that later became the Coromandel Group of Free Settlers. Their Minister at Wells Street was among those who contributed character references to support their applications for free settler passages to New South Wales. 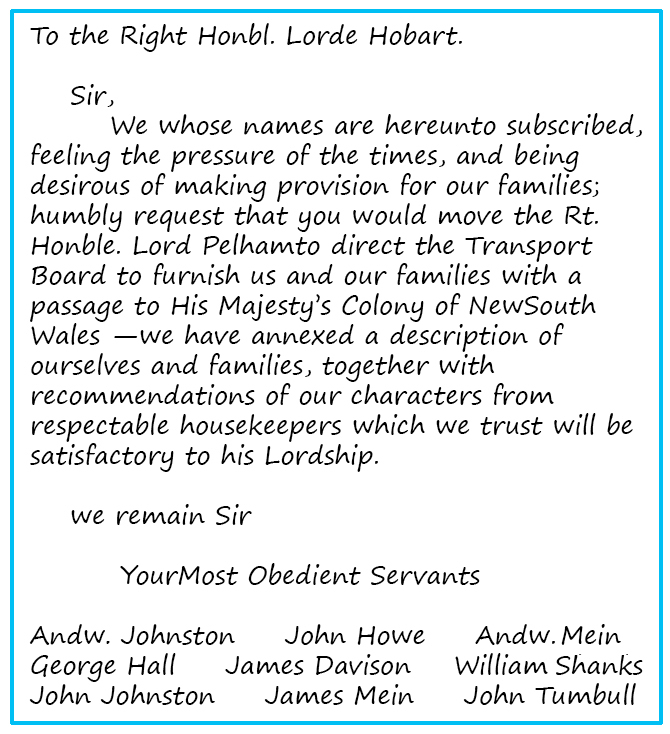 Letter requesting a free passage to the New South Wales colony. Three of George’s and Mary’s nine children were born in London. Sanitation and drainage were so inadequate there, that infant deaths outnumbered births. The three Hall children survived but the second child, George Jnr, was so sickly that his parents sent him back to Northumberland, to the care of Mary’s sister, where he stayed until passage on the Coromandel was approved. The reasons for George’s determination to settle in New South Wales were several but workers’ group (early trade unions) riots against oppression by vested interests, rising inflation, rorting of food and commodity prices, and religious intolerance were among them. Concern for their children’s health undoubtedly contributed (their oldest child was the nine-year-old Elizabeth) and religious intolerance rankled. The Marriage Act of 1753 stated that legal marriages could be performed only by a Church of England parson. Although Presbyterian, George and Mary were married according to Church of England rites. George and his companions were particularly fortunate in being passengers on the Coromandel although they would not have realised it. She was only a small East Indiaman, 125.5 ft (38.2 m) from stem to stern with a maximum beam of 32 ft (9.8 m) but, on this particular voyage she set three records with obvious benefit to passengers: the fastest voyage (121 days) to the colony by any ship during the first twenty-nine years of the colony, the first non-stop voyage to the colony, and, the longest non-stop voyage by any ship, up to that time, 15263 nautical miles (28285 km). Coromandel also distinguished herself by making three voyages to the New South Wales colony without loss of convict life. The only deaths during the 1802 voyage were from within the Presbyterian group: Andrew Mein, and the three-year-old son of Andrew Johnston. When the Coromandel berthed in Sydney in 1802 the best land within easy reach of Sydney, still a tiny settlement huddled around Circular Quay, had been allocated. 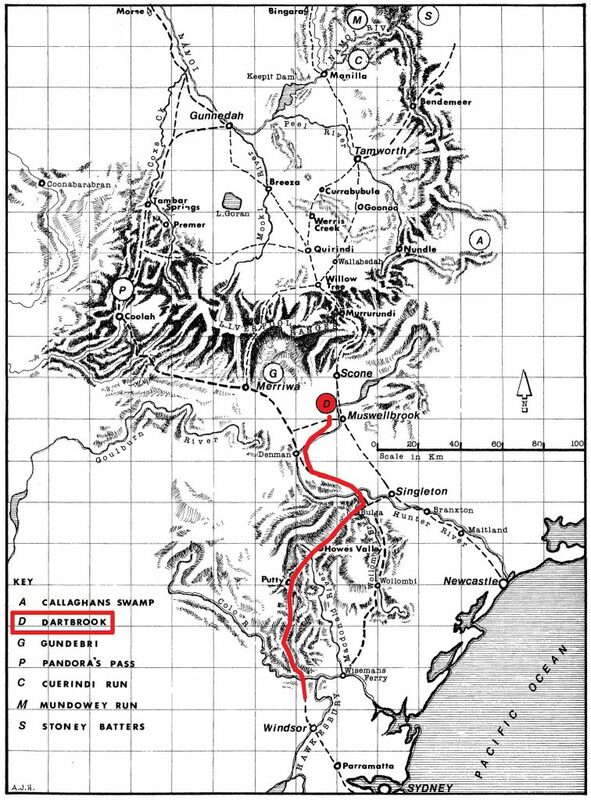 George and the other Coromandel settlers were dissatisfied with their first grants along Toongabbie Creek, over 30 km to the west of the settlement and protested to the Governor. The formerly productive farms there had been over-cropped to exhaustion. Their protests were heard and they were granted farms in the Hawkesbury Valley on the fringes of the settlement. George’s first Hawkesbury grant, in 1803, was 100 acres (40 ha) and two sheep. He took with him, from Toongabbie, his two convict servants — involuntary passengers on the Coromandel. By 1806 he owned 127 acres (51 ha) and was cropping wheat, maize, barley and potatoes. He had established an orchard and was running sheep, goats and pigs, and had also acquired two small farms in Auburn, now a western suburb of Sydney, giving him 123 acres (50 ha) for probable use as holding paddocks about 20 km from Circular Quay — closer to his customers, the butchers and butchers’ agents, than the Hawkesbury Valley. Street names including Northumberland Road, Dartbrook Road, St Hilliers Road and Simpson Street may have been laneways between the Auburn paddocks. Year by year, George continued to increase his land holdings. Area of the New South Wales colony c. 1800. As well as his trade skills of carpentry and joinery, and agricultural machinery, George brought with him considerable business acumen, honed in London. Most importantly, he had money. Unlike many of his fellow settlers, George never seemed short of money or in any financial difficulty. Quite the contrary. George lent money, with farmland as security. Some of his land acquisitions were probably the result of foreclosures on loans. By 1821 his land and stock return declared 1500 acres (607 ha), including 850 acres (344 ha) in the richly fertile Hawkesbury Valley. Australia’s population increased rapidly, both from convict arrivals and free settlers. During the 1810s about half the population was in the Sydney area. Although the relative proportion of Sydney’s population to the entire colony — Tasmania to Queensland — decreased during the 1820s and later, Sydney’s population, itself, still grew rapidly in parallel with the total population. The astute George would have been aware of Sydney’s population growth and, as soon as he was well established in Pitt Town, made plans for northward expansion. He intended to be a major contributor to Sydney’s dinner tables. His family increased, along with his land, and by 1820 his resources included seven sons, five of whom were already young adults. Later, George’s grandsons contributed towards taking up new lands and supervising their development. Family members were, undoubtedly, much more conscientious than any paid overseer and those family members contributed enormously to the growth of George’s pastoral empire. John Howe, one of the Coromandel settlers, was chief constable at Windsor from 1814 to 1821 and, during this period, mapped a route from the Hawkesbury to the Hunter Valley. By 1823 the route Pitt Town — Howes Valley—Bulga (the Putty Road) was well-travelled; it was the only road from Sydney to Newcastle. The stock route from Pitt Town to Dartbrook and other stock routes, c. 1840. Base map: A.J.Howard. The scene was set for George Hall to extend his operations northward into the Hunter Valley. He had an established road to his future properties and a rapidly growing market for his produce. George took full advantage of both. 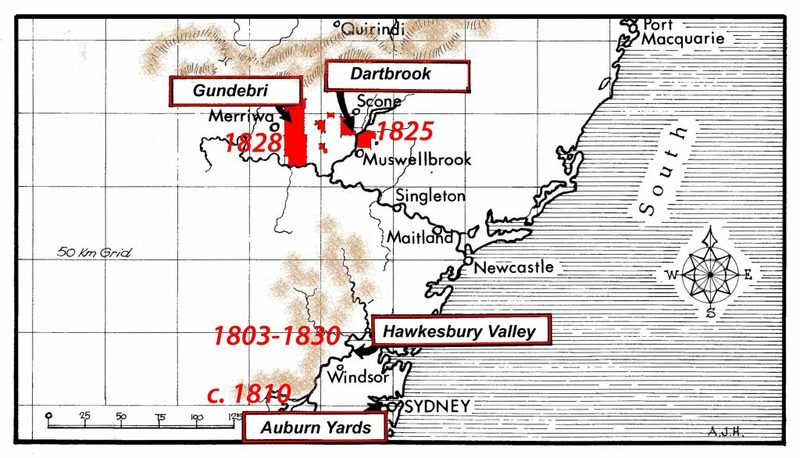 By the end of the 1820s he was established in the Hunter Valley with large land holdings, including Dartbrook and Gundebri, managed by his sons. 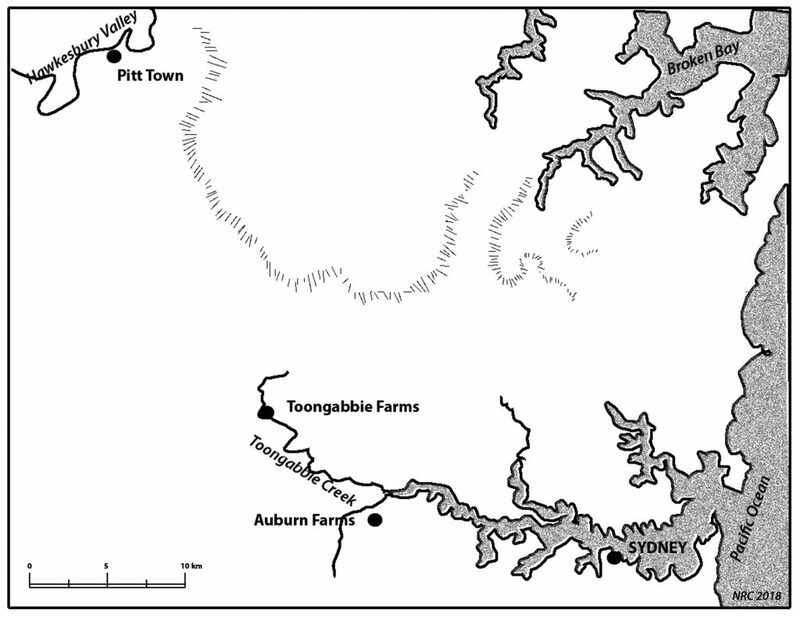 Approximate establishment dates of Hall properties in the Hunter and Hawkesbury Valleys and western Sydney. Base map: A.J.Howard. In a future blog I will develop the argument that the Halls’ imported working dogs are unlikely to have landed in Australia much before 1830 and that Thomas Simpson Hall’s breeding program towards the Halls Heeler was during the 1830s. By the 1850s and 1860s, after more than ten years, the Halls Heeler was an established breed, not an experimental dingo cross. I cannot see why anti-Dingo attitudes of the 1850s and 1860s should have been prejudicial to Thomas Hall’s breeding activities in the 1830s. As to document destruction. Bert Howard described to me a visit to a Hall descendant who had promised him documents and photos. When Bert arrived, the documents and photos were smouldering in a back yard fire. Secrecy about family documents is not uncommon. I was told this long ago, first by the Special Collections Librarian at the State Library of NSW and later by the Historian at the NSW Births, Deaths and Marriages Registry. I note that you mention that there is pretty strong evidence that the Halls destroyed many records. My take on this would be that by the 1850’s – 60’s the dingo was considered in the growing rural sector to be a pest and dangerous.